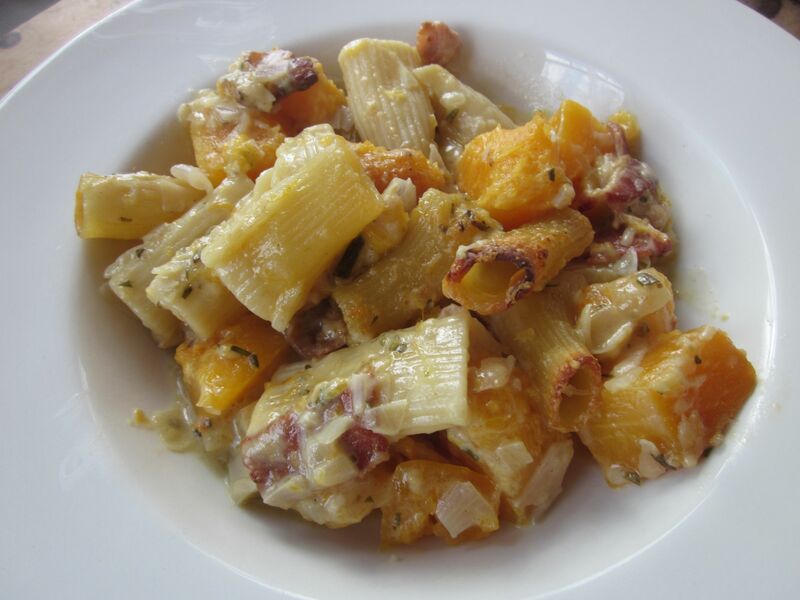 This recipe is a tad on the time-consuming side, but the process can be divided into 4 easy stages: 1) cooking the pasta, 2) prepping the ingredients, 3) making the squash sauce, and 4) combining the pasta with the sauce and baking. Steps 1, 2 and 3 can be done hours or up to a day ahead; then do step 4 about 45 minutes before dinnertime. Add a simple green salad (and at our house, crusty bread) and dinner’s served. 1) PASTA: Bring a large pot of water to a boil; add pasta and 1 Tablespoon kosher salt. Stirring occasionally, cook pasta according to package directions until just short of al dente. (About 13 minutes; pasta will continue to cook in the oven.) Drain and rinse pasta; set aside. If you plan to reserve some plain pasta for picky eaters, save some pasta water so you can cook the pasta a little longer. I add the plain pasta, some pasta water and some butter to a bowl & then microwave right before serving. 2) PREP: Starting at the top of the sprig, strip rosemary leaves off their stems. 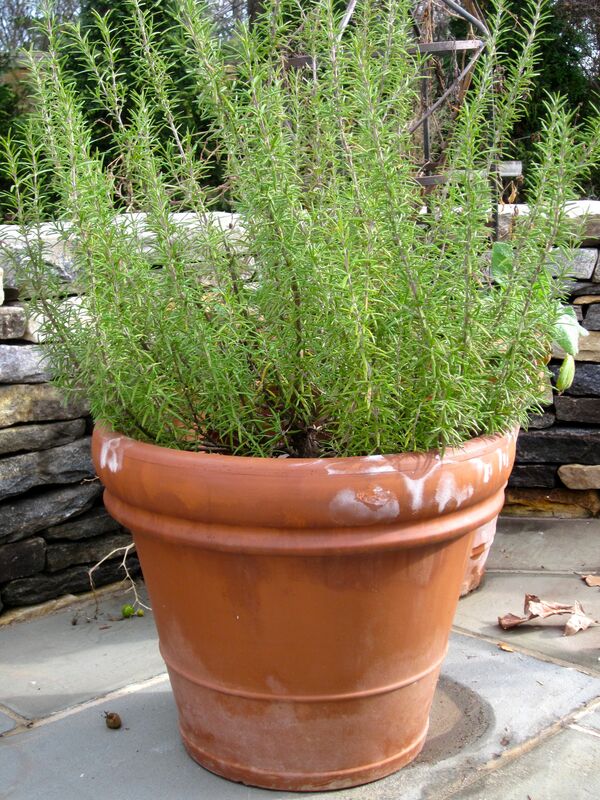 (This 18” stem from my potted rosemary bush yielded 2 heaping Tablespoons.) Chop and set aside. 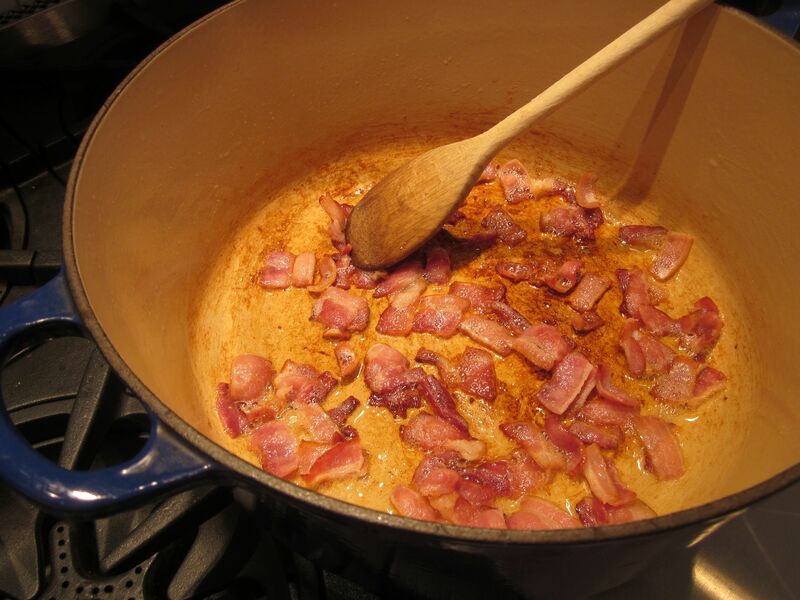 3) MAKING THE SAUCE: In a large heavy pot or Dutch oven over low heat, cook bacon slices until crisp. If your bacon is lean, you may need to add a splash of olive oil to get the process going. With a slotted spoon, remove cooked bacon and set onto paper towel to drain. Neat freaks (and I say that endearingly): resist the urge to clean the pot. You want all that brown stuff at the bottom. 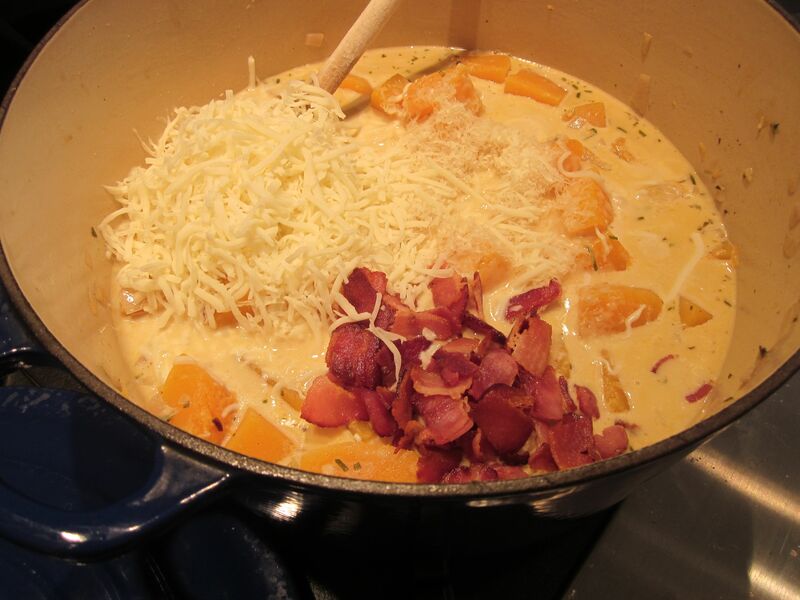 Remove all but 1 Tablespoon bacon drippings from the pan (or add olive oil if there’s not enough). 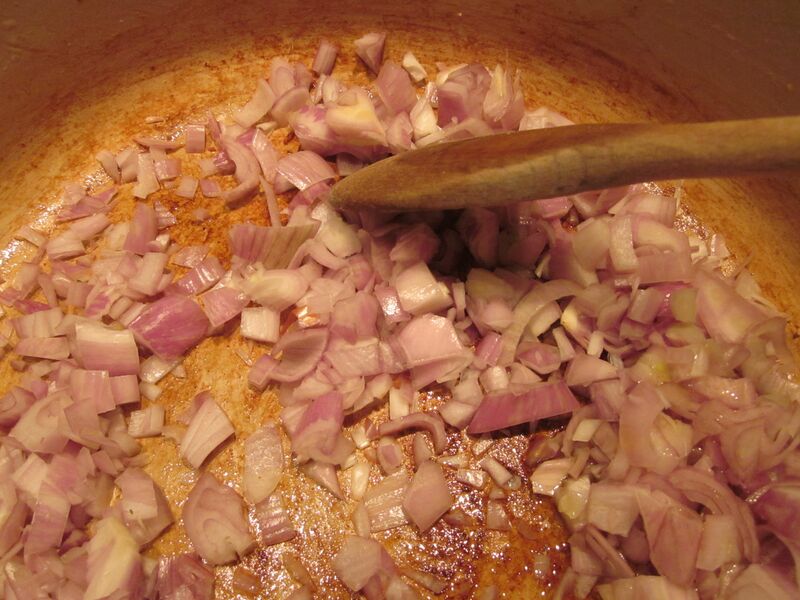 Add shallots/onions to pan and sauté over medium low heat until translucent. 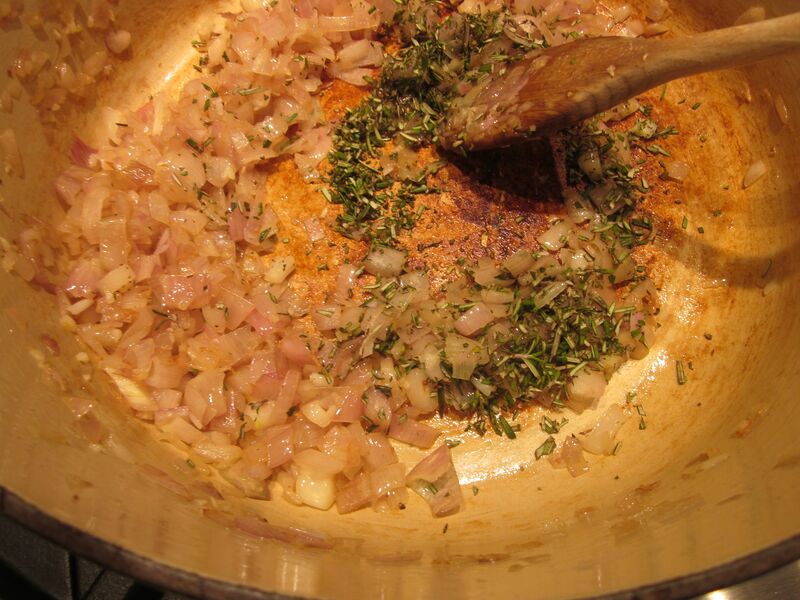 Add rosemary and minced garlic and sauté for another minute. Add squash cubes, chicken stock and bouillon cube to pot and bring to boiling. 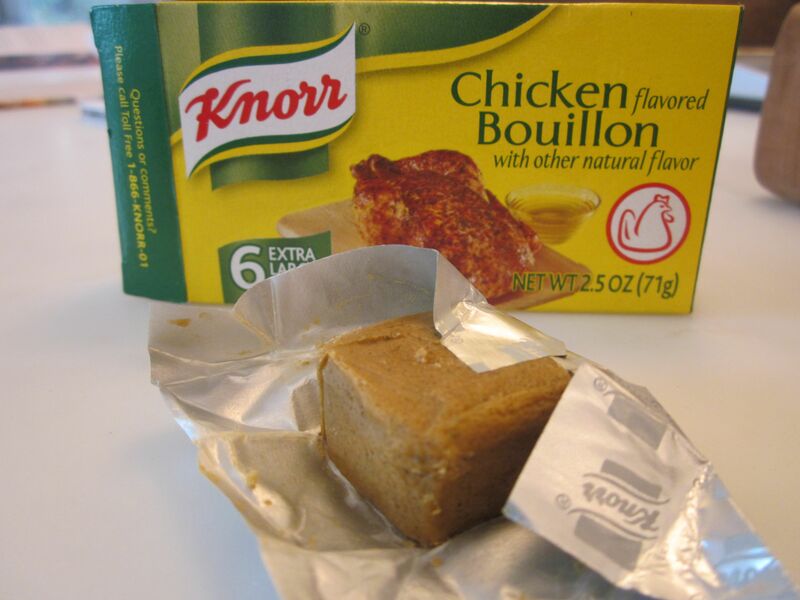 Bouillon cubes are one of my dirty little secrets – more on this in a future post. Add 1 teaspoon kosher salt if you are not using bouillon cube. 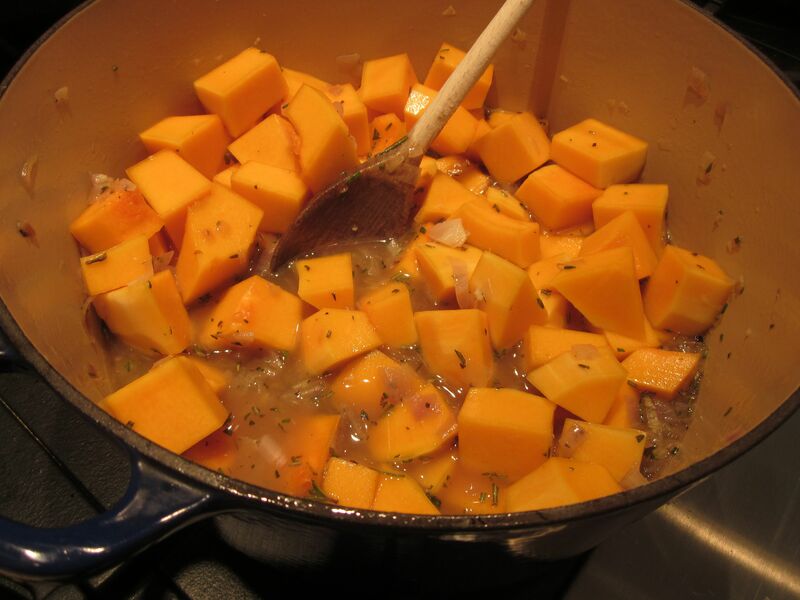 Reduce heat and simmer, covered, for about 8-10 minutes or until squash is tender when pierced with a knife. Preheat oven @ 350º if planning to bake right away. At this point remove a few squash cubes for any à la carte eaters. Add cream and boil for another minute or two. Remove from heat. Bake at 350º for 30-45 minutes or until top is browned and sauce is bubbling. 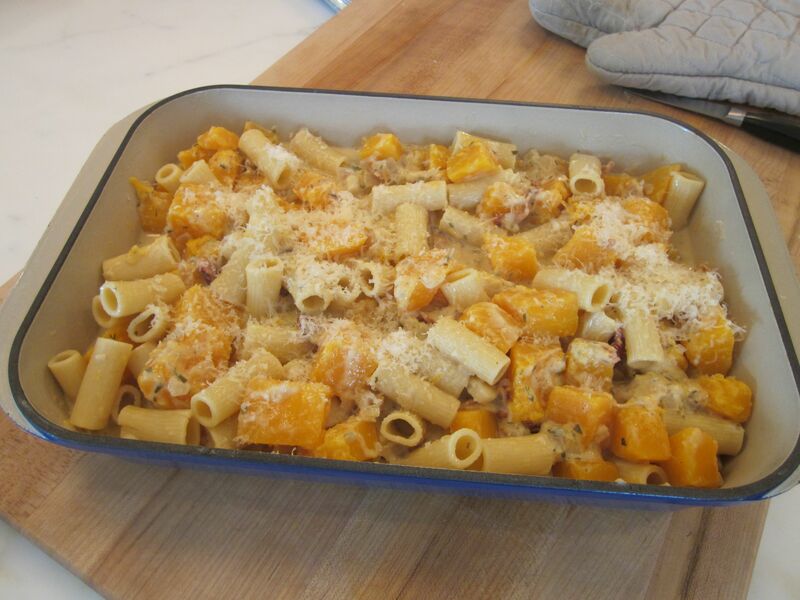 This entry was posted in Main Courses, Pasta and tagged baked rigatoni, butternut squash, fresh rosemary by subeeskitchen. Bookmark the permalink. Miaaaaam, ca a l’air delicieux Chef Sue. Pourquoi avoir attendu si longtemps pour creer ce blog? I’m loving it!! And I happen to have an extra butternut squash on my counter. YUM! SueZQ – my favorite foodie! This one looks FAB!!! going to have to try it – so tired of same old meals! Do the kids eat it?! Oh & not sure if we have 4 food groups anymore – when the government has classified Pizza as a vegetable for Pete’s sake! Ha! Yummy! I am definitely going to make this. I will resist the temptation to substitute lower fat ingredients since it looks too good to spoil by trying to make it less caloric. You could use less cream and more chicken stock . . . or just add another Bar class! Yum!! This looks awesome. Can’t wait to give it a try! I made this for my very finicky in-laws and it was an enormous success! Thank you for this delicIous recipe (which produces even more delicious leftovers!) and thanks for keeping the entire family happy! Absolutely delicious! Keep the recipes coming! Your mom served this at a luncheon recently and I called her that evening for the recipe. She directed me to your blog and I’m so glad she did! 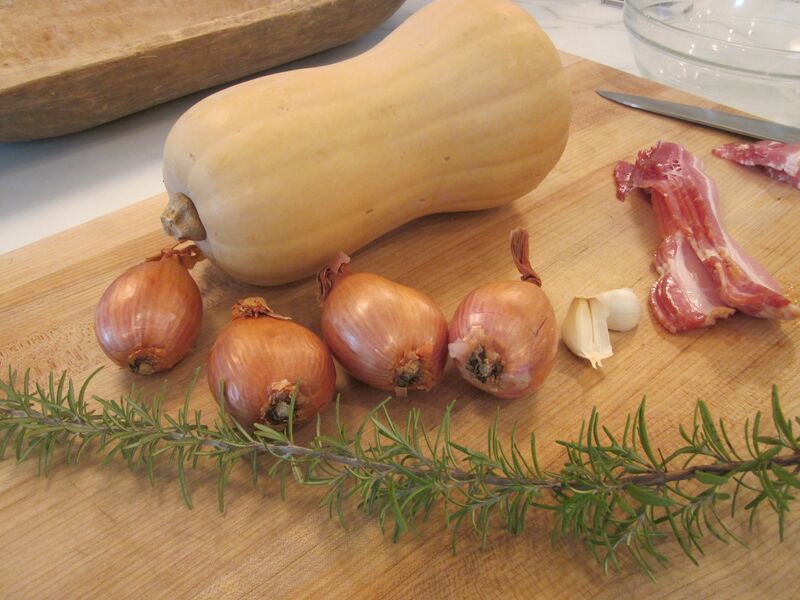 I made this recipe for my family and everyone absolutely loved it- it’s me new favorite fall recipe (I can’t wait to make it again). Looking forward to trying more of your recipes! So glad you liked the squash dish! It’s one of my fall favorites as well. Happy cooking! Sue, Happy Thanksgiving to you and your family. Hope you are all well . 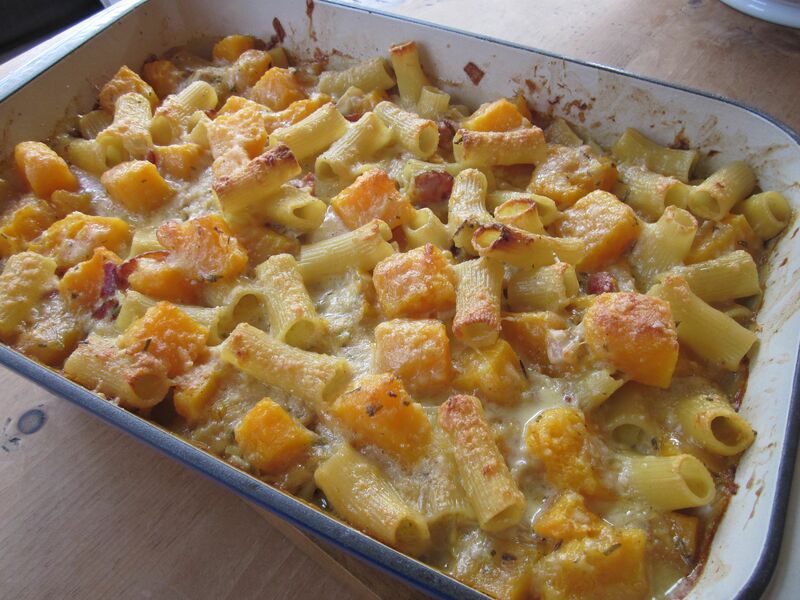 I have to tell you that I made this Butternut Rigatoni for my friends and they went wild….have had to share this recipe with all of them. It was just great and so nioe to make this time of year. Hi Diana! Happy Thanksgiving to you! Glad your friends liked this recipe. Was just thinking of you and your pistachio cake the other day :). Let me know if you ever make it down to this area!